We’d love your help. Let us know what’s wrong with this preview of Death at Bishop's Keep by Robin Paige. Kate Ardleigh is not a Victorian lady - outspoken, egalitarian, American, and a writer of penny-dreadfuls. Aunt Sabrina invites her to Essex England, for help with the Order of the New Dawn. Aunt Jagger beats the servants to suicide, and someone feeds her Death mushrooms. Next door, Sir Charles photographs a fresh body in an archaeological dig, and seeks his killer. To ask other readers questions about Death at Bishop's Keep, please sign up. To me these are more than a cozy mystery. The husband and wife team that write under the pseudonym of Robin Paige put a great deal of research into each of these. Each centers on a different historical person or event and they do not scrimp on these details. That is what them so endearing and comfortable. You may ask why only a three stars rating? I wanted to leave room for the others in the series. Also in this first entry they had to set up the backgrounds of the two main characters. Although n To me these are more than a cozy mystery. The husband and wife team that write under the pseudonym of Robin Paige put a great deal of research into each of these. Each centers on a different historical person or event and they do not scrimp on these details. That is what them so endearing and comfortable. This was fun. I debated a bit between three and four stars, but in the end I rounded up. For two reasons, I was sold on the characters, and this is how I like my convention flouting. Seriously, it's kind of great. Our heroine has more modern attitudes, but for reasons that make complete sense given her background, upbringing and personality. She's American, and only goes to England because a long lost aunt offers her a post as a secretary there. She wasn't born into the upper classes and has alway This was fun. I debated a bit between three and four stars, but in the end I rounded up. Seriously, it's kind of great. Our heroine has more modern attitudes, but for reasons that make complete sense given her background, upbringing and personality. She's American, and only goes to England because a long lost aunt offers her a post as a secretary there. She wasn't born into the upper classes and has always had to support herself. She also doesn't have the unbelievably irritating trait so often associated with convention-flouting of hating every single convention in her society. She seems to have been invited to a ball at the end of this one, and has happily agreed to dance at it. Basically, she's inquisitive, puts herself forward, is interested in a variety of subjects, wears sensible clothes, and believes that her opinion shouldn't just be disregarded because she's a woman. Also she likes adventures. The balance works is all I'm saying. Also, I really like the dynamic between her and the love interest, Sir Charles, who sort of gets sucked into a murder investigation because he needs things to occupy his mind. (Our heroine gets sucked in because she's hoping for material for plots for the penny dreadfuls she writes.) And I like their two friends from next door's manor. I also really like (most of) the supporting cast. Stand-outs are one of her two aunts, the household staff, and the vicar. Oh, also, there's a fair bit of literary meta. There's a chapter that is essentially "Oscar Wilde, Arthur Conan Doyle and W.B. Yeats walk into a spiritualist meeting...," which sounds like the first line of a joke, but maybe also sort of works? On the other hand, it's not perfect. The start is problematic, and slow. I actually started this a while ago, but got about eight pages in. In fact, if I hadn't picked it up again yesterday, it probably would have gone back to the library unfinished. This takes a bit to get going, is all I'm saying. Secondly, one aunt is absolutely terrible. She's the kind of character I hate because she's so very terrible, but to no purpose. Like I get that your life didn't got he way you wanted it to, but you could have a comfortable home, if you were just the slightest bit reasonable. I get that awful, bitter, people, exist. But I don't know... it felt extreme here. Secondly, I'm not sure how I feel about (view spoiler)[both aunts conveniently being murdered two thirds of the way through. Conveniently, because obviously the main character inherits everything. Also, I liked one of the aunts. And lastly, it doesn't leave a heck of a lot of time for crime-solving, beyond just having Kate look at the pictures and go, "Ah! I know what happened!" To be fair, there was another seemingly unconnected murder earlier, but still... (hide spoiler)]. The plotting also really made this feel like a set-up book. Like, this is where the author obviously wanted the character to be going forward, so she made it happen. That said, I still quite enjoyed it. And honestly, I am completely sold on the developing romance, so I have requested the next one from the library. A thoroughly enjoyable read! Well written and fast paced with two very likable lead characters in Kathyrn Ardleigh and Sir Charles Sheridan. I really liked the fact that I was actually stumped as who the guilty party was right up until the revelation was made. There's 12 books in this series, if the remaining 11 are as charming as this one, I cannot wait to begin reading them. Robin Paige is the pseudonym of husband and wife writing team Susan Wittig Albert and Bill Albert. This is the fourth novel in the victorian england series they co-write. I really like Wittig Albert's Beatrice Potter Series and someone at 'Murder By the Book' suggested this series to me. It is the first one I have read and I will be reading others. Kate Ardleigh is an American who writes. She is trying to eke out a living to do what makes her happy and to be independent. She thinks she is above ' Robin Paige is the pseudonym of husband and wife writing team Susan Wittig Albert and Bill Albert. This is the fourth novel in the victorian england series they co-write. Kate Ardleigh is an American who writes. She is trying to eke out a living to do what makes her happy and to be independent. She thinks she is above 'typical' romance and pursues a more meaningful life. Out of the blue she finds she has family in England. She is invited to come as a secretary to her aunt. Seeking an adventure and curious about family she goes. Not only does she meet her aunt, she meets two aunts. The good aunt and the evil aunt. She also meets Sir Charles Sheridan who is, of course, her male counterpart. She also walks into a murder and a conspiracy. Well, this was a pleasant read. I was a bit wary of the information dumping at the beginning of the book (which continues during the whole thing by the way), but the mystery is sufficiently satisfyingly written to forget what is less artfully done. I'll surely be reading the next book in the series. Death at Bishop’s Keep follows mostly two characters: the first one being Kathryn Ardleigh, a thoroughly modern and independent American lady, and the second being Sir Charles, an English gentleman with an interest in… well, all kinds of things, from murders to mushrooms. It opens with Kathryn, though, as she’s offered a job with her heretofore unknown British aunt, and travels across to England in order to become her secretary. She quickly finds that though the si Reviewed for The Bibliophibian. I read this series a while ago (I remember being upset when the author's announced there would not be any more Kate Ardleigh/Charles Sheridan books) but I didn't remember enough of this one for it to feel like a re-read. The main character is an independent young woman from the United States who is employed by her aunt in England to do secretarial work. Kate hadn't known about her English relatives and goes over without committing to staying. Her aunt is involved in the Order of the Golden Dawn, I read this series a while ago (I remember being upset when the author's announced there would not be any more Kate Ardleigh/Charles Sheridan books) but I didn't remember enough of this one for it to feel like a re-read. Her aunt is involved in the Order of the Golden Dawn, a spiritualist society that includes Sir Arthur Conan Doyle and the poet William Yeats among its members. Kate also has a secret - she writes "penny dreadfuls" under a pseudonym, and she uses her experiences to add to the stories she writes. A decent Victorian mystery with a likeable protagonist. American Kate Ardleigh writes penny dreadfuls until estranged aunt Sabrina Ardleigh invites her to England, for help with her secretarial position for the Order of the New Dawn. But Sabrina's vicious sister Mrs Bernice Jaggers abuses and beats servants; some blame their malicious mistress for shaming maid Jenny into suicide last year, despite the eagerness to marry of Jenny's beau Tom. Next door, visiting Sir Charles finds man's body in his archaeological dig. Charles on the trail of the killer American Kate Ardleigh writes penny dreadfuls until estranged aunt Sabrina Ardleigh invites her to England, for help with her secretarial position for the Order of the New Dawn. But Sabrina's vicious sister Mrs Bernice Jaggers abuses and beats servants; some blame their malicious mistress for shaming maid Jenny into suicide last year, despite the eagerness to marry of Jenny's beau Tom. I've been looking for new historical mysteries to read and Susan Albert was recommended to me by a friend. Susan writes many mysteries set in different time periods with different aged women detectives. She has a series set in the present day, late 1800's and early depression. 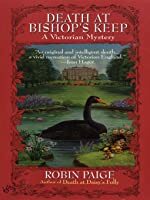 Death at Bishop's Keep is the 1st of her historical series set in American and later in England. The main character, Kate is intelligent with a clever wit. She's an American author who suddenly comes into an opportunity to travel to England to live with relatives that she didn't knew existed. The mystery starts early on in the story, which I enjoyed. It was interesting to learn about using fingerprints and photographs during investigations. It wasn't an accepted form of evidence yet, but the other main character, Charles Sheridan, uses them to assist the police in solving a murder found at an archeological dig. I enjoyed the unique back story of Kate secretly collecting bits of information for her new mystery novel she's trying to write. She refers to herself as her pen name often, when she's trying to convince herself to take chances and snoop around. The story moved along nicely, and an additional murder happened later in the book which added another spin to the story. Review - I was very pleasantly surprised by this novel. I thought it would be a kind of chic lit with some mystery in it, but it isn't. It's primarily a crime / mystery book with essences of romance. I love Kathryn as a character and I am intrigued to know more about Charles Sheridan, who I hope features more prominently in future books. I just stumbled across this series by accident, but if the rest are as good as this then it's a great little series. Charact Review - I was very pleasantly surprised by this novel. I thought it would be a kind of chic lit with some mystery in it, but it isn't. It's primarily a crime / mystery book with essences of romance. I love Kathryn as a character and I am intrigued to know more about Charles Sheridan, who I hope features more prominently in future books. I just stumbled across this series by accident, but if the rest are as good as this then it's a great little series. First in the series, but my second read of the series. I used to like historical romances and historical mysteries, but kind of lost interest in them. I preferred more contemporary stories. However, I am enjoying these books. The two non-conventional main characters are interesting and not too outside the norm to stretch belief. As in the first book I read, real life people make appearances in this book as well, though they do just make appearances and were not as central to the story as in Deat First in the series, but my second read of the series. I used to like historical romances and historical mysteries, but kind of lost interest in them. I preferred more contemporary stories. However, I am enjoying these books. The two non-conventional main characters are interesting and not too outside the norm to stretch belief. As in the first book I read, real life people make appearances in this book as well, though they do just make appearances and were not as central to the story as in Death at Daisy's Folly. With the enormous interest in forensics today, it is almost weird to find fingerprints just starting to be used - ballistics and photography as well. Both Kate and Sir Charles seem to be very much on top of these new scientific methods, but the police, at lease the police in these books, don't seem to realize their potential. Kate and Sir Charles are a bit of an unusual couple (not quite in this book, but the hints are there). I want to read more. When America Kathryn Ardleigh is brought to England to act as her previously unknown aunt's secretary she see it as a great opportunity to meet her long lost relative and to do some research to help her in her secret occupation as a writer of penny dreadfulls. Assisted or assisting sir Charles together they must discover the identity of a mysterious murdered man. This is a great murder mystery and the attitude to women in Victorian England is frightening but Kathryn is a wonderful breath of fresh When America Kathryn Ardleigh is brought to England to act as her previously unknown aunt's secretary she see it as a great opportunity to meet her long lost relative and to do some research to help her in her secret occupation as a writer of penny dreadfulls. This is a great murder mystery and the attitude to women in Victorian England is frightening but Kathryn is a wonderful breath of fresh air which the men in the story find scary and confusing. This is a light weight, but interesting historical mystery series. What makes the series outstanding is the authors' blend of real characters and extensive research into the stories. Folks like Rudyard Kipling, Winston Churchhill and the Prince of Wales show up. An excellent series for those of us who love historical mysteries. A fine, gentle, Victorian series. Kate is just sedate enough to be believable as a 1800s lady, and more than modern enough to scandalize her societal counterparts. I mean, really. How dare Kate wear a skirt short enough to show an entire inch of ankle! Gewoon een heerlijke detectiveroman die zich afspeelt aan het einde van de 19e eeuw met een vrouw in de hoofdrol die zich niet neerlegt bij de beperkingen van haar tijd. Nooit superspannend maar wel onderhoudend. Creative mystery in historical setting! I love the style of writing and humor in this book. Love the main character and her "American" ways. Definitely want to read the whole series. Kindly sent by my dear friend Hayes. What a lovely and surprising book. Kate is a twenty-something American living in New York. Her English father died before she was born, and her Irish mother died hen she was five. Kate was raised by her Irish aunt & uncle with a pack of cousins, including boy cousins, who taught her useful things, like skipping stone and how to fight. Kate loves reading and writing - in her spare time, she's Beryl Bardwell, successful authoress of two published shiller-shockers -- melodramtic stories published by magazines in those days. For her last employer, Kate took dictation and typed correspondence, and she learned German (as her employer was a German woman) to do so. She's ambitious and bright. Kate is determined to make her own way in the world, as an authoress of drama, mystery, terror, and suspense. On her way home from collecting a check for another of Beryl's stories ("Missing Pearl, or The Lost Heiress"), she notices a man following her; her sense of adventure decides to find out what he wants, and she corners the man, much to his surprise. Turns out he's a Pinkerton detective, hired to find her by her Aunt Sabrina Ardleigh in England. Miss Ardeligh wants to employ Kate as a secretary-companion, and she's willing to pay for Kate's journey to England (including ship passage) and take Kate on for a 1 year trial at Bishop's Keep, the family home. Kate is intrigued. The money is right, and the adventure is too much to pass up. Sir Charles and Kate meet at the train station. Kate has come from London with Miss Elenaor "Ellie" Marsden on the train. Miss Marsden is the sister of Brandon, Charles' friend, who invited Charles to stay at Marsden Manor. Ellie is a proper young English lady, engaged to wed a widowed chocolate factory owner (best chocolates in England!) who is 20+ years her senior. But this is Victorian England, where young misses make matches with eligible English gentlemen based more on money, class, and status than on love. Charles is instantly taken with Kate - he's never encountered a "lady" quite like her. She's handsome, inquisitive, intelligent, well-informed, full of natural self-confidence, and determined. She knows about fingerprints and photography. (Well, of course she does! It's Beryl's job to be "up" on the latest crime detection techniques! But Beryl is, of course, Kate's secret.) Kate is taken by Charles, too - and not just his looks, but his scientific bent, the way he actually listens to her and doesn't automatically brush her off because she's a woman. AND Charles tells the group about the murdered man! When Kate arrives at Bishop's Keep, she finds not the Gothic castle she supposed, full of ghosts and all sorts of things to fill Beryl's stories. Instead, she finds a well-built Georgian home. But the PEOPLE in the house have more than enough material for Beryl's stories! Her Aunt Sabrina is the eldest of the Ardeligh children. When Kate's father, Thomas, insisted on going to America, his English father wrote him out of his will. And when the youngest girl, Beatrice, insisted on marrying a soldier, her father wrote her, too, out of the will. So the Ardleigh fortune and grounds belong solely now to Sabrina - the spinster who is devoted to the local vicar and to a new "society" called the Order of the Golden Dawn. Aunt Sabrina seems nice enough, and her expectations of Kate's employment are reasonable. But Aunt Jaggers (Beatrice) is not a reasonable woman by any means. She's harsh, judgmental, and holier-than-thou. Jaggers is bitter that Sabrina received all the inheritance, and she has some secret that she's holding over Sabrina's head - something that allows Jaggers a free hand to run the house and treat the servants worse than dirt. Not that Jaggers treats anyone kindly; she constantly argues and yells and complains and generally makes life disagreeable for everyone. She's suspicious of Kate and determined to rule her; in Jaggers' mind, Kate is an employee, therefore a servant, therefore under Jaggers' domain. But thankfully, Aunt Sabrina disagrees. Upon hearing a few details about the murdered man, such as he had a golden scarab ring, Sabrina asks Kate to gather more information about the man, but cautiously. Sabrina doesn't want anyone to know her interest in this case. Kate finds out enough from Sir Charles and from the ensuing investigation that Charles takes on to link the dead man to the Order of the Golden Dawn - and to Aunt Sabrina, who is working with Kate to compile a membership roster, type up the charter, and organize the society's secret and founding documents and mysteries. Sir Charles can't figure out how Kate is so informed - and how she keeps turning up at the same locations he does during his investigations. (OK this is where the Victorian male mind-set comes into play. Sir Charles can't fathom Kate's interest, curiosity, or ability to think through the evidence and clues for herself to come to some of the same conclusions that he does!) In fact, it rather unnerves him that Kate seems to be his equal in finding and processing evidence! He locates the carriage that the foreign man, a Mr. Armand, hired - and matches the damaged wheel to the photograph of the impressions that the carriage's wheel made at the scene of the crime. In the carriage, he locates a fingerprint. But he's surprised when Kate finds a broken feather - looks to be a peacock feather. That's all Kate needs to link the man to the Order, because peacock feathers and scarab jewelry are the signs by which members identify one another. All of this leads us to Kate being an initiate at the Order of the Golden Dawn, attending meetings held by a Mrs. Farnsworth, a former London stage actress of some renowned. Mrs. Farnsworth likes to surround herself with interesting people, and she invites the likes of Oscar Wilde, Conan Doyle (not yet a sir), and Will Yeats to the Order's social gatherings. She is building the local temple for the Order, and yes, that means she's got charge of the money - raising it and putting it to use. When is transcribing some of the Order's documents, including letters from a German woman giving Mr. Westcott (head of the Order and Mrs. F's lover) full permission to start the Order and provides the secret documents for the occult mysteries of the order, Kate finds that something's just not right. Seems the German is incorrect; in fact, it looks more like an English speaker passably familiar with German wrote the letter - in other words, a forgery. That, as well as other things about the Order's documents that just don't add up make Kate suspicious. She confides her suspicions to Aunt Sabrina, but carefully. Because there's a mighty storm of trouble brewing in the house. A former young housemaid, Jenny, has died just after childbirth. Jenny was turned out of Bishop's Keep by Jaggers upon discovering that Jenny was pregnant and unmarried. In fact, Jaggers shamed Jenny into leaving with no references, thereby no way to be further employed. Jenny made her way to London, and eventually died in the poorhouse. The Cook and the Butler, as well as Jenny's "boyfriend" all blame Jaggers for Jenny's death. And none of the servants is too keen on the way that Jaggers treats them anyway. Between that and the mounting tension between Sabrina and Jaggers, Kate is concerned that murder is about to happen. And she's right. After eating a mushroom pudding at dinner, both Sabrina and Jaggers each die an agonizing death the following day. Kate didn't eat any of the pudding, because Jaggers greedily took Kate's portion, as well as her own. Which leaves Kate and Sir Charles with 3 dead bodies and lots of questions: Who is Mr. Armand? Whom did he come to England to see and why? What is his connection to the Order? Who slipped the Death's Cap poisonous mushroom into the mushroom pudding - was it Cook? Henrietta? Nettie? the Butler? Tom, Jenny's lover? Or someone else? WHY? My only nit with this book is that it seems to take a LONG time and many pages to get the story rolling. In between, we're faced with lots of discussions about the British Motor Car Syndicate and whether or not it was a good investment... All the strum and durst of the local Constable, who isn't terribly interested in solving the murder of Mr. Armand... And lots of "extra" stuff that provides some background and color, but not much in the way of moving the story forward. It could be that because this is the first book in the series, the author(s) decided to lay additional groundwork for the following books. Let's hope so! Because the overall story is fun and different. An American gal and an English "sir" who compliment each others' skills and intelligence and curiosity solving crimes together sounds like a winning team. Since there are several books in the series, I must conclude that other readers thought so, too. The historical setting for this 1st in the series is late 1890's in Victorian England. There were many reviews that stated this was a slow-starting book, but I found it to be well-written and fast-paced once the characters, settings, and murder mystery were introduced. The story begins in New York where Kathryn Ardleigh is secretly writing penny-dreadfuls to earn a living after a former employer died and writing under the pseudonym of Beryl Bardwell. Kate is an American with an English father an The historical setting for this 1st in the series is late 1890's in Victorian England. There were many reviews that stated this was a slow-starting book, but I found it to be well-written and fast-paced once the characters, settings, and murder mystery were introduced. The story begins in New York where Kathryn Ardleigh is secretly writing penny-dreadfuls to earn a living after a former employer died and writing under the pseudonym of Beryl Bardwell. Kate is an American with an English father and an Irish mother who both died when she was young. She was raised by poor Irish relatives. Kate is almost a spinster at the age of 27, has unruly red hair, is independent, intelligent, non-traditional, self-confident, has a natural curiosity, and likes adventure. She is contacted by a Pinkerton agent and discovers she has an aunt she didn't know about living in England. This aunt, Sabrina Ardleigh, wants her to travel to Dedham, to Bishop's Keep, where she lives and become her secretary. Kate craves experiences to incorporate into her stories, so she readily agrees to go. On the train ride from London to Colchester, Kate travels with Eleanor Marsden who is her aunt's next door neighbor and eventually becomes a good friend. Meeting the train is Eleanor's brother Bradford and Sir Charles Sheridan. Sir Charles is staying at the Marsden Estate while he is documenting, in pictures, an excavation at an archaeological dig in Colchester. A recently deceased body is found in one of the holes. He has a golden scarab ring on his finger which was not stolen. Later, a blue peacock feather is found in the carriage he rode to the dig in. Valuable clues. Kate expects Bishop's Keep to be an ancient medieval castle with cobwebs and ghosts, but is disappointed to find a dull looking Georgian residence. Her aunt Sabrina turns out to be a kindly, gracious woman with intelligence and individuality wearing a golden scarab Egyptian pendant. But surprise, surprise, there is also another aunt living at Bishop's Keep named Bernice Jaggers who is pure evil. There seems to be a secret that Jaggers has found out about Sabrina and the local vicar and is holding this information over her head, emotionally blackmailing her, and brutalizing the servants. Sabrina is reluctant in interfere. Aunt Sabrina is a member of the Order of the Golden Dawn, an esoteric society organized for the study and practice of ritual magic. Dr. William Westcott is the chief of the order. Her aunt wants Kate to organize and copy documents pertaining to the society. When pressed, Sabrina lets Kate know she was hired because she can type and knows German. She will be translating some original documents of the society written in German. But Kate discovers something fishy about these documents. Then something catastrophic happens to the two aunts which changes Kate's life and circumstances. Sir Charles and Kate are attracted to each other and their observational skills and problem solving complement each other. Sir Charles is reluctant to admit this though because of male opinions about women. The investigation into the death at the dig is the perfect opportunity for Kate to research and gather experience for her stories. Sir Charles, who was born to a wealthy and prominent family, has a great interest in science, fingerprints, photography, mushrooms and detection. He is intrigued that Kate isn't the typical Victorian lady. Sir Charles helps out the local police, specifically Inspector Wainright, because the department can't afford the new gadgets such as typewriters, telephones, cameras, fingerprint analysis, etc. Wainright is also cautious of the new technology. 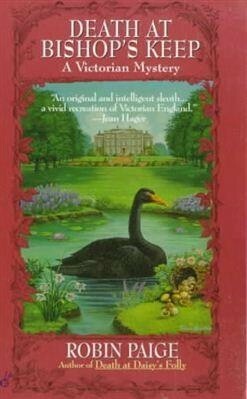 I saw Death at Blenheim Palace at a book sale back in high school and from there I discovered Robin Paige. Internet wasn't accessible back then so I've always thought that Robin Paige to be one person. It turns out, Robin Page is a conglomerate pen name for Susan Wittig Albert and her husband, Bill Albert. And as expected, their uncoupled presence in the novels seems to emboss through the characters Kathryn Ardleigh and Charles Sheridan. But, considering it a rare feat, the novel was smooth enou I saw Death at Blenheim Palace at a book sale back in high school and from there I discovered Robin Paige. Internet wasn't accessible back then so I've always thought that Robin Paige to be one person. It turns out, Robin Page is a conglomerate pen name for Susan Wittig Albert and her husband, Bill Albert. And as expected, their uncoupled presence in the novels seems to emboss through the characters Kathryn Ardleigh and Charles Sheridan. But, considering it a rare feat, the novel was smooth enough to hold a singular tone even though it was written by two authors. Death at Bishop's Keep finds Kathryn Ardleigh and Charles Sheridan's relationship in inception. The book held an interesting way of presenting different perspectives of different characters. The Alberts, or should I say Paige, was able to define each characters' tone even upon shifting perspective. You can see it through their vocabulary and the way the characters view the setting. This is quite difficult to pull of in a smooth fashion, considering in a mystery novel details are the foundation. Paige also begins a chapter with an excerpt from either a body of work that inspired the authors or a piece of important artifact within the story. This may paint a prescient and foreboding body of knowledge for the readers if one opts to read into it, but it expounds the chapters to keep the essence intact. It should also be noted how accurate (according to my contemporaneous research) the places, historical events, and famous people (ehem, Oscar Wilde) are in the story. The dates, the names of certain landmarks, and other picturesque landmarks were all accurate upon my confirmation. It seems the authors did competitive research that other mystery writers like Dan Brown should have taken notes. Though my extra-curricular readings are often a glimpse and a skim, Death at Bishop's Keep has opened a history of cultures I never find in other books i.e. River Stour and the rise of the automobile industry. At current time, it seems baffling that Americans are said to be egalitarian in comparison to their British neighbors. But the novel reminded me of the roots of cultures and beliefs. Death at Bishop's Keep is an interesting read. Paige, like Agatha Christie, opts for a title that reveals someone will die at a certain location. But the story is so intricately woven, that details started falling into place by the end and I couldn't help but admire both writers for coming up with this story. New York in the 1890s, Kathryn Ardleigh is not the expected gentlewoman of the times to be, she is a writer. Not just of nice woman fiction but of the "penny-dreadfuls" filled with violence, romance and adventure. She writes under the name of Beryl Bardwell as it is a career that is frowned upon for women. Kate has found it has paid her bills since her previous employer passed away, leaving her without a job. To go back to being a secretary-companion or governess was just too dreary. She finds he New York in the 1890s, Kathryn Ardleigh is not the expected gentlewoman of the times to be, she is a writer. Not just of nice woman fiction but of the "penny-dreadfuls" filled with violence, romance and adventure. She writes under the name of Beryl Bardwell as it is a career that is frowned upon for women. Kate has found it has paid her bills since her previous employer passed away, leaving her without a job. To go back to being a secretary-companion or governess was just too dreary. She finds herself being shadowed by a man in a bowler one night, when she is going to collect payment for her latest story. When she confronts the man, he hands her a card and tells her to appear at the address on it - Pinkerton Detectives. This sets in motion events that will completely change her world. She is given paid passage to sail to England to her father's ancestral estate. An aunt, Kate has no knowledge of, wants her to come live with her at Bishop's Keep. Kate is given the choice to accept or refuse the offer. Being a little impulsive and feeling that there could be some good material for a future story, Kate accepts. When Kate arrives, she finds it isn't as wonderful as she expected. It seems that there is Aunt Sabina, who sent for her, and Aunt Jaggers - Sabina's older sister. Jaggers is a bitter woman with many dark secrets. Her hold over Sabina is a puzzle to Kate. When a body is found at an archaeological dig nearby, Kate sees a chance for research for the story she is currently writing, in secret. There is also the mystery of the Order of the Golden Dawn and what its connection is to Sabina and the murdered man. It is a secret society that has wide reaching branches. Sir Charles Sheridan, a gentleman and amateur detective, is introduced to Kate by neighbours and also develops an interest in this interesting American woman. She isn't like the Victorian women he is used to. I have mixed feelings about this story. I agree that it was slow moving ahead but as another reviewer mentioned it is an introduction to a series and the authors needed to set a groundwork. Other authors have had to do it too but are more subtle. Kate encompasses all of the qualities that writers of this genre use: unruly red hair, intelligent, unadorned, modern, non-conformist, straight-forward, independent, non-traditional. It has become a bit of a cliche. One thing that bothered me about the st I have mixed feelings about this story. I agree that it was slow moving ahead but as another reviewer mentioned it is an introduction to a series and the authors needed to set a groundwork. Other authors have had to do it too but are more subtle. One thing that bothered me about the story was the idea that the occult was acceptable and not demonic. It made me wonder about the authors. Even the vicar in the story was a member of the occult club, which meant that his vicarage was a sham, but that idea isn't even thought of here. The mean aunt Bernice was the only example of Christianity and she was way off base too,a hypocrite, caught up it her piety and religion and not the spirit of Christianity. The Robin Paige Victorian/Edardian mystery series was written by Bill and Susan Albert from 1994-2006. There are a dozen books in the series (now completed), beginning in the mid 1890s and continuing through 1903. The series, beginning with 'Death at Bishop's Keep'. features two amateur sleuths: Kate Ardleigh Sheridan Robin Paige is the pen-name of husband and wife team Bill and Susan Wittig Albert. The series, beginning with 'Death at Bishop's Keep'. features two amateur sleuths: Kate Ardleigh Sheridan and Sir Charles Sheridan, later Lord Sheridan , Baron of Somersworth. Kate is an Irish-American woman who writes under the pseudonym of Beryl Bardwell. She comes to England and inherits a small fortune and the estate of Bishops Keep, located in East Anglia, near the village of Dedham, Essex. Sir Charles is a landed peer and amateur scientist with a special interest in new forensic techniques, such as fingerprinting, ballistics, toxicology, and photography.